The Delete Loops function analyzes the mesh to find edge loops that are not necessarily needed to contribute to the overall shape of the mesh. It then deletes those edge loops, based upon user-defined settings. This function doesn’t function based on the silhouette of the model. Instead it ana­lyzes the curvature of the surfaces. Keep in mind that this feature only works with edge loops within the topology. It won’t work on “messy” topology such as scan data com­posed of triangles. As with most ZBrush functions, mask intensity can be used to modulate the operation or to completely protect an area. The Delete Loops settings can drastically change the appearance of a mesh. Several combinations can produce interesting shapes which can eventually be reused for other purposes. One example is to create a base mesh for displacement maps. The Angle slider defines the angle tolerance of the deleted loops. Low values will remove a minimum of loops to keep the curvature very close to the original while higher values will be more destructive. The Aspect Ratio slider defines the maximum relative width and height ratio allowed for each new polygon created by the Delete Loops feature. 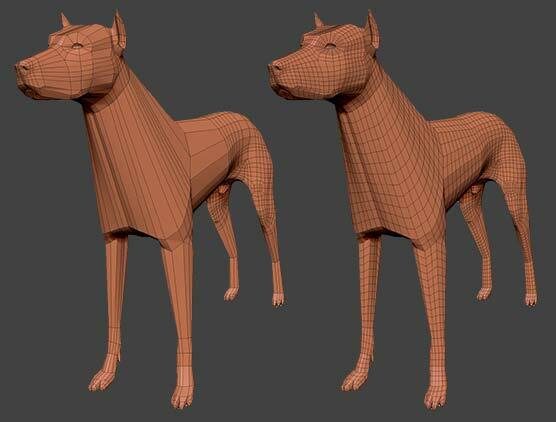 For example, if this was set to 4 then ZBrush will maintain the polygon’s height to be no more than four times its width, regardless of the Angle setting. In other words, ZBrush will first analyze the mesh based on the Angle setting to de­termine where loops should be removed. It will then check to make sure that the new polygons would not exceed the Aspect Ratio setting. If they do not, the edge loop will be removed. If they do, the edge loop will be kept. This mode allows the Delete Loops function to analyze partial loops in addition to completed loops. For example, a DynaMesh will often have partial loops rather than perfect edge loops, and this setting will allow Delete Loops to work with such a mesh. 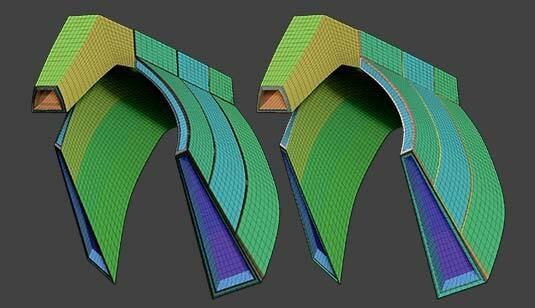 With this setting active, ZBrush will ignore edge loops that define PolyGroup boundar­ies. The function is similar to Delete Loops, except that it will not remove the edge loops. It analyzes the mesh in the same way but then simply moves the surfaces to match the shape that would have been established had Delete Loops been pressed instead. Note: Because the Align Loops function doesn’t alter the topology, you can produce interesting re­sults by first storing a Morph Target and then using Align Loops. After this you can use the Morph brush to restore some areas here and there.